A majority of American adults suffer from periodontal, or gum, disease, which is considered one of the most preventable causes of tooth loss today. Gum disease is both highly preventable and highly treatable, particularly when diagnosed in its early stages. Early-stage gum disease is commonly called gingivitis and can often be treated non-surgically. Later-stage periodontal disease may also be able to be treated without surgery, but our West Hollywood periodontal surgery office may recommend surgical treatment for more advanced cases in order to prevent tooth and tissue loss. One of the first-line treatments against gum disease is scaling and planing. Scaling and planing is essentially a deep cleaning procedure that removes all traces of plaque and tartar buildup that could irritate the gums and cause decay and infection. Scaling and planing, along with good dental hygiene, may be sufficient to reverse periodontal disease in its earliest stages. When gum disease advances, our specialist for periodontal surgery in West Hollywood may suggest more extensive treatment options. One of these is pocket reduction surgery. Gums should fit securely around the roots of each tooth, but the infection and bacteria associated with gum disease can create pockets that provide more space in which bacteria can accumulate. This can lead to bone and tissue loss and ultimately tooth loss. Our West Hollywood periodontal surgery expert will carefully clean the bacteria and infection from the pockets and smooth the bone so that the gums can become attached again. 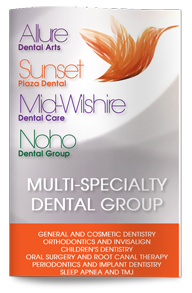 Our specialist for periodontal surgery in West Hollywood may also have other surgical and non-surgical periodontal treatment options that will help restore healthy gum tissue and improve your oral health. Gum disease has been linked to diabetes, preterm birth, and cardiovascular disease. The earlier it is diagnosed and treated, the more likely treatment is to be successful and the less invasive the treatments will need to be. Dr. Bijan Afar, our West Hollywood dentist, is a board-certified periodontist who can examine you for signs of periodontitis and suggest appropriate treatment options that may be able to reverse or halt the spread of the disease and prevent further complications. Contact us today to schedule your appointment.